Did Cara Delevingne Rip Off a Vintage Feminist T-Shirt Design? A battle is brewing between model Cara Delevingne and an LA-based design studio called Otherwild. 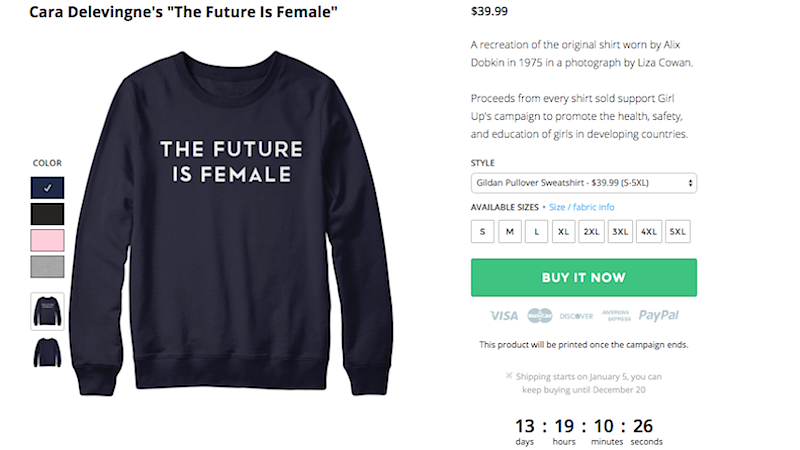 Owner Rachel Berks accused Delevingne of ripping off her shop’s design of a t-shirt printed with the slogan, “The Future is Female.” After being photographed in Otherwild’s design, Delevingne has announced she decided to sell the shirts herself, with proceeds going to the United Nations Foundation’s adolescent girl campaign, Girl Up. According to a New York Times article from last month, the shirt’s original design was made for Labyris Books, the first women’s bookstore in New York City. In 1975, Liza Cowan took a photograph of her girlfriend at the time, wearing the shirt. The picture began making its way around the web and caught the eye of Berks, who then decided to remake it while donating a portion of proceeds to Planned Parenthood. Delevingne’s girlfriend, Annie Clark, a.k.a St. Vincent, spotted the sweatshirts at a lesbian feminist haunted house called KillJoy’s Kastle, and purchased two. In Delevingne’s Instagram post, she doesn’t mention Berks or Otherwild at all, but thanks Cowan for “the wicked design.” This brings up an important question. When it comes to reproducing a vintage design, can it truly be considered a rip-off? Berks thinks so, and reposted Delevingne’s photo calling her out, while referring to her as a “celezbian,” which upset some followers. The slogan’s origination is from Jane Lurie’s and Marizel Rios’ Labyris Books (1972) and Cowan’s image of Alix Dobkin was used with permission. Otherwild’s reissue and redesign of the slogan is protected under copyright law, which mandates that any reproduction of an existing known public work must be altered at least 20% from the original. If Delevingne wanted to sell my shirt design, she would need to wholesale them from Otherwild - and because Otherwild donates 25% of our line proceeds to Planned Parenthood, Delevingne’s ethical practice would benefit not only our women-owned small business, but also serve as a significant donation to PP. If Delevingne didn’t want to do that, she could create her own design of the slogan on shirts and sell them. But Delevingne cannot lift and manufacture Otherwild’s design, claim it as hers and sell it, which she has done. What Delevingne has done is unscrupulous and unethical, and ironically counters the very message of the slogan “The Future Is Female”. It is confounding that she would do this to a small queer feminist-owned business after purchasing the product from us just a few weeks ago. She has changed the attribution several times today, but she has not offered to wholesale from us, or cease and desist producing and selling our shirts and create her own design. The shirt — whether believed to be copied or not — was intended for a good cause. Hopefully, Delevingne and Berks can work out their differences. Images via Represent.com, Otherwild, Instagram, Twitter.